Bombing Busters was released for PS4 a while ago, and now comes to Vita owners. Nevertheless – if you never played the PS4 version then the game will still be a very familiar sight to old school gamers. Remember Bomberman (or Dynablaster)? Bombing Busters is exactly that type of game, though with a few twists and changes here and there. For those not familiar with the original Bomberman games – they take place in grid-based levels scattered with non-breakable and breakable objects. The ones that break can do so when you place a bomb nearby, but you have to get out of the way of its blast before it goes off. As you keep doing this, you clear more of the playing field, eventually enabling you to try and take out the other players who started on the other side of the grid. There are power-ups to be found as well (for speed, more bombs or stronger bombs, just to name the three major ones), all helping you with your main goal: blow up the others, and avoid being blown up. The description above is about Bomberman, but fits Bombing Busters word for word. 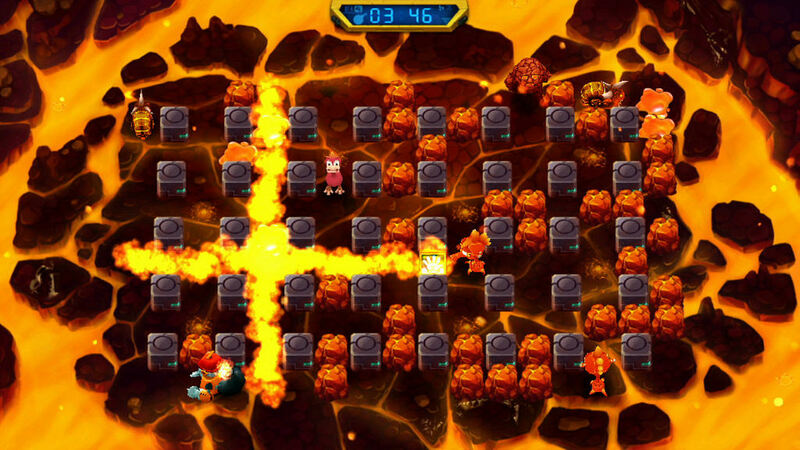 The game isn’t just inspired by Bomberman – it’s a clone. Which isn’t a bad thing, because we’re talking about a classic here – one that best works in (local) multiplayer. This is something that’s also supported in the Vita version, but you’ll need a PS4 to host the game (it’s a cross-buy title, don’t worry). Your alternative is to try and find an online game, but we spent more time waiting for one than actually playing matches. So the road to get to a multiplayer game is littered with a few obstacles, but when you get there it’s a familiar and fun sight indeed. Unless I missed something, this is your best chance at multiplayer Bomberman fun on the Vita! 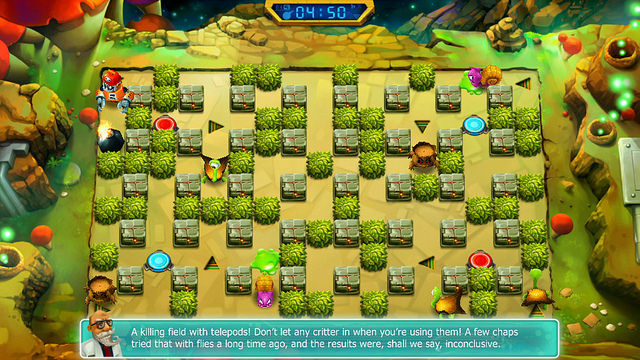 Bombing Busters also features a single player campaign mode, which elaborates on the basic Bomberman gameplay in a number of ways. Computer-controlled enemies can shoot at you, there are teleportation devices and wind can blow your bombs all over the screen, to name a few. Single player mode starts out rather casually, but near the end of world/area 2 things quickly become immensely difficult – almost to the point of being too frustrating to play. This is especially true for the boss fights, which border on unfair with a lot of seemingly random deaths that can’t be prevented. By the time we finally beat them, it felt like it had more to do with luck than with skill. So while multiplayer strikes a perfect balance between fun and frustration, the single player mode’s difficulty level leans towards the impossible at times. This makes the multiplayer game the main draw here (just as it was with the original Bomberman! ), but that’s a mode best (and more easily) played using local multiplayer on the PS4. Luckily, that version is included, and you can use the Vita version to hone your skills and strategies before inviting some friends over.